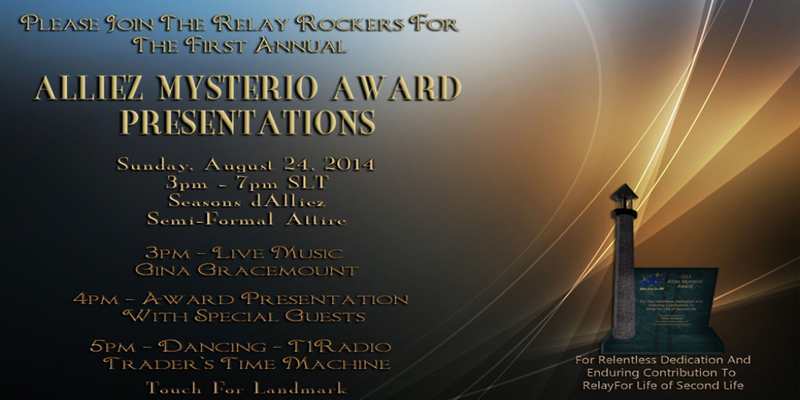 The Relay Rockers are planning to present an award in honor of their late co-founder Alliez Mysterio. Beginning this season the Rockers will present the Award to the Relayer(s) who they feel best exemplify Alliez’ dedication by their contribution to Relay. The award is to be presented at the team’s Thank You party, Sunday August 24, 2014, with the party beginning at 3pm. Alliez Mysterio came to Second Life in 2003. A pioneering virtual explorer Alliez saw the potential of the nascent private island sims and in 2005 her first sim, Rue d’Alliez opened. From that single island d’Alliez Estates spread over the grid, growing to more than 150 islands. She established a system of ownership and rentals that has provided a home to many residents of Second Life regardless of their virtual manifestations, lifestyles or interests. She made every effort to accommodate her tenants, was always there to address issues and was loved by all who came to know her. In 2005 she joined with Trader Whiplash and Nuala Maracas and formed the team that became known as the Relay Rockers. 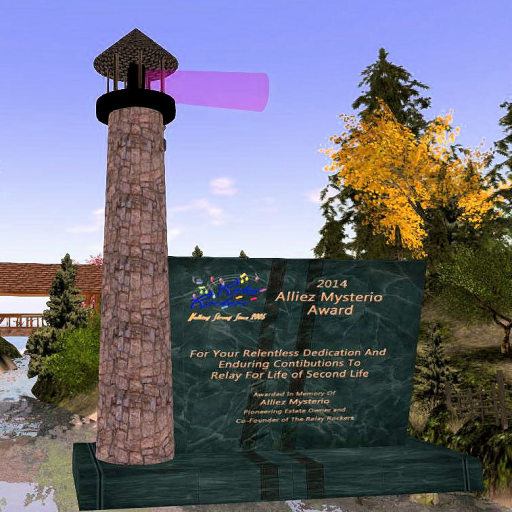 From 2005 until breast cancer took her from us in 2013 Alliez was a steadfast supporter of both the Relay Rockers and Relay For Life of Second Life. Alliez Mysterio left an indelible imprint on our virtual world and she is missed by one and all. This Award will honor both Alliez’s memory and the dedication of the awardees. The Rockers, who celebrated ’10 Years Walking Strong’ this season finished with the highest possible fund raising level, Purple. They raised more than L$5 million through their signature events, Bid Me Bald and the Celebrate-Remember-Fight Back Top DJ Competition. They were also honoured during Relay weekend with the coveted “Returning Team Participation Award” as well as 1st place for The Inventive and Creative Fundraising Award and 2nd place for The Cancer Education Campsite Award. Everyone is invited to attend and are asked to dress in semi-formal attire. Previous Post: Fantasies, Fashions and a new Happy Hunting HQ! Next Post: Calling all classic horror fans! Make sure you don’t miss the HP Lovecraft Festival! Pingback: News of the First Alliez Award & the 2014 Relay Rockers Thank You Party (Post-84236) - [O.L.D.] Old London Docks - Best Second Life Blog Feeds!